Today, Australia is among the countries leading the way in commercial drone integration globally. This is in large part thanks to major investments from major aerospace and software industry players, innovative new technologies, and a continued focus on research related to solving regulatory challenges and ensuring the industry’s safe expansion. Drones are no longer seen as the toys of hobbyists, but as critical tools for organizations looking to drive operational efficiencies, reduce costs, increase data-driven decision making and improve safety. As drone technology is adopted by enterprises for countless use cases across Australia, a few key industries will undoubtedly see the most impact. Perhaps the industry with the biggest impact potential, drones are helping the telecommunications organizations address major infrastructure maintenance challenges and reduce costs. Where tower inspections traditionally required workers climb tall towers, posing serious safety risks, especially in treacherous weather, drones can now keep worker’s out of harm’s way, carrying out routine inspections more quickly and safely. In addition to offering efficiencies and helping lower costs, the data collected by drone inspection -- whether picture, video, or measurements -- can be viewed in real-time from anywhere by the right expert, and is automatically uploaded to the cloud to allow for on-demand access and faster analysis. Beyond routine inspections, drones can also help telecommunications companies in the face of a disaster, flying over networks to assess damage and helping to expedite issue resolution. Drones can also help telecommunications companies optimize their networks, surveying areas to identify frequency obstructions and helping to inform the location and height of antennas. And with key application integrations, drones can also be used to quickly perform needed network testing. Beyond routine inspections and infrastructure optimization, drones can play a critical role in disaster recovery efforts, flying over networks to assess damage and helping to expedite issue resolution, and acting as part of a Cell on Wheels (COW) site to help meet short-term demand following natural disasters. Today, mining is one of Australia’s most well-established industries and a primary contributor to the Australian economy, making it ripe for innovation and improvement. In fact, the mining industry was among the first to embrace drones. Today, the technology is helping slash the costs associated with surveying land and conducting regular asset inspections in often remote areas, replacing traditional labor-intensive, manual practices and replacing more costly tools like that were previously required to capture important information. With the help of drones and ability to view the live stream in real time, all key personnel can more quickly get the visibility and data needed, from anywhere in the world. Even more importantly, the enhanced visibility and real-time aerial assessments enabled by drones can also improve mining safety. With drones, teams can gain instant visibility of a situation from anywhere in the world with ultra low latency of 100-200 milliseconds. And with the ability for up to 50 pre authorized users to view the video stream simultaneously and in real time, the technology makes for a powerful collaborative tool for mine management, incident management and security teams. More than $1.2 billion worth of trade passes through Australian ports every single day. Today, shipping companies and ports are leveraging drone technology for a number of tasks ranging from security and surveillance to the monitoring of port environments to tank inspections. Routine internal and external ship inspections -- traditionally highly-manual and time-consuming tasks that could pose risk to works -- can now be carried out by drone in a safe and efficient manner without the need for engineers to access dangerous areas of the ship. 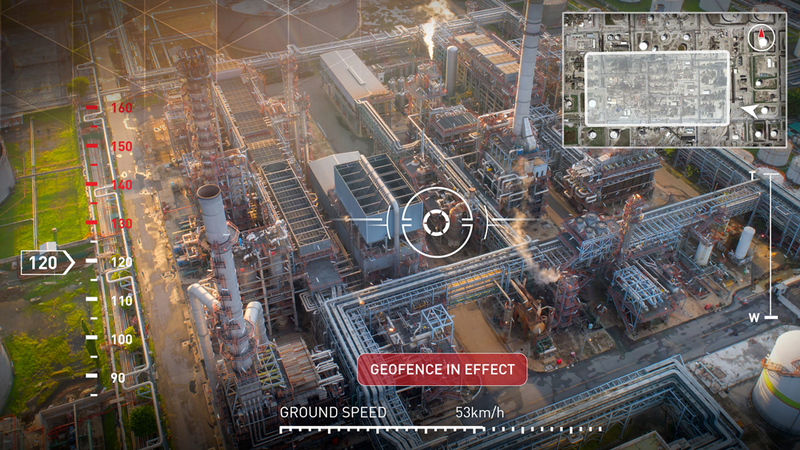 Further protecting teams, drones equipped with sensors can also measure potential noxious gases prior to further inspection by engineering staff. Looking ahead, drones are also being tested for aerial cargo delivery and remote tug piloting operations. In Australia, like U.S. cities, local governments or “councils” must constantly inspect public facilities and equipment. Drones can be used to more efficiently and safely inspect anything from telecom towers to recreational fields and structures to toilet blocks, freeing up time and resources to focus on higher-value tasks. Onsite drone pilots can more quickly conduct flights in the field, while in direct communications with engineers at their desks. And with the flight details and video and imagery collected available in the cloud, it’s easily accessible and referenceable by any authorized user who may need to draw from the data in the future. Through the use of drones and accompanying cloud data management, collaboration is faster and more effective than ever before, as project team members no longer have to travel onsite together -- or even be in the same room -- in order to gain real-time visibility. This is especially helpful for collaboration between large corporations and city governments who require access to consistent visual information for compliance checks. Across industries, drones are quickly becoming a go-to tool for reducing costs, driving business efficiencies and improving the safety of human workers. Be sure to check back soon for our Part 2 of this series, exploring other key applications for drones in Australia.